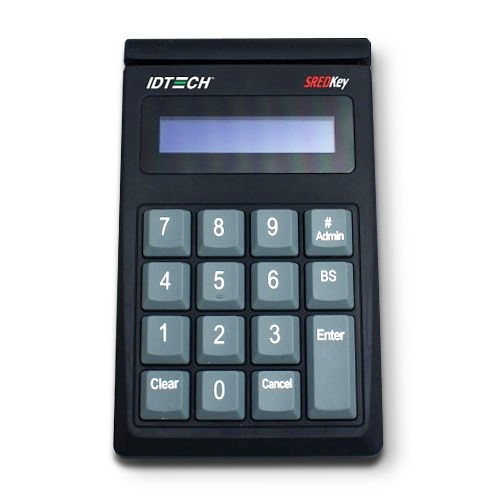 ID TECH SREDKey is a PCI 3.0 certified encrypted numeric keypad with a Magnetic Swipe Reader (MSR) that reads up to three tracks, which also has the SRED function supported. The unit is equipped with tamper switch so once the device is tampered, all the information will be removed automatically. The keypad allows the retailers to not only encrypt credit card data at the magnetic readers but it also encrypts manually entered credit card number, expiration date and etc. The SREDKey has 15 keys (10 Numeric, 5 functional) with a 2x20 backlit LCD.